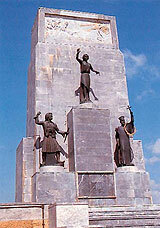 The Greek revolution against Turkish in March 1821 was initiated at province of Kalavrita. The liberation of Kalavrita was held on March 25 after a 5-days Turkish resistance; main place of celebration was the Monastery of St. Lavra, where an official doxology took place. At St. Lavra's Church Paleon Patron Germanos put Greek Fighters under oath before the beginning of the Greek Revolution against Turks. As history reveals, priest-monk Neofitos brought the Flag of the Revolution at the Monastery; it is kept there up till now and can be viewed by visitors. Miraculously the Flag has not suffered any damage, despite the arson and looting that took place in the Monastery of St. Lavra. Nowadays the Flag of the War of Independence is unquestionably the most important relic that Greek nation has. Nazi invaded Kalavrita at Dec 9 1943. Tey set fire to houses allegedly owned by geurillas, and then they searched for wounded German soldiers injured in the battle of Kerpini. In the early hours of Monday, 13th of Dec, Nazi officers and soldiers ordered people to gather at the city school. German soldiers separated women and children from their male relatives and friends and from any male thet was older than 14 years of age. Women and children were kept imprisoned at school, and the town of Kalavrita was set on fire. Every male citizen of over 14 years of age was forced to walk on the hill "Kapi", where German's machine guns murdered all the entire male population. Only 13 people managed to survive the short-distance last shooting; few of them are still alive trying to cope with that nightmare. At school the imprisoned women and children lived their own nightmare, because fire from the surrounding houses was almost a moment away. They managed however to escape by breaking doors and windows but the horrible reality was to be seen; running through flaming houses the desperate tried to search for their loved ones, but in vain infrastructure of Kalavrita was destroyed. Hundreds of lives, properties and families were murdered, burnt and turn into pieces. The clock of the central church, which was stopped, at exactly 14:34 p.m. on Dec, 13th 1943, is still a reminder of that unfortunate day.